The first trailer for Rocketman has been released, featuring Taron Egerton as legendary rock musician Elton John. Earlier this week, we were treated to the first image of Egerton as John, sitting on a private jet. Egerton is wearing a gold jacket, short shorts, golden winged boots, and a gold chain, looking exactly like Elton John did in the 1970s. Egerton even has a receding hairline in the photo. John had, and still does have, a very unique style. It wasn't out of the question for the musician to show up for a concert dressed like Donald Duck or even the Queen of England. Rocketman tells the story of Elton John's early years all the way up to his massive success and the pitfalls of addiction. John is not shy when talking about his past, and the movie promises to be an uncensored look into the life that he led on and off the stage, which is evident in the first trailer for the biopic. Much like John's sense of style, Rocketman is no ordinary biopic about a famous musician. Instead, it almost looks like a big screen adaptation of a fantasy musical that has yet to hit the stage. Dexter Fletcher is directing Rocketman, fresh off of saving the day for the Queen biopic, Bohemian Rhapsody. Fletcher took over directorial duties when original director Bryan Singer was let go from the project for increasingly erratic behavior on the set and getting into fights with star Rami Malek. It appears that the set of Rocketman has been a pleasant experience without any craziness spilling out into the tabloids. The project has been in development since 2012, but didn't really pick up steam until 2017 when it was revealed that Taron Egerton would be starring as Elton John and Fletcher was attached to direct. Rocketman is named after one of Elton John's best-known hit singles. The song was written by John and his long-time collaborator Bernie Taupin in 1972. The hit single is inspired by the short story The Rocket Man in The Illustrated Man by Ray Bradbury, and it shares some lyrical similarities to David Bowie's "Space Oddity." "Rocket Man" has been ranked by Rollingstone Magazine as the 245th best song of all time in a recent top 500 list. Rocketman opens in theaters on May 31st, 2019. From the looks of things, producer David Furnish was not kidding when he said that Taron Egerton is amazing as Elton John. The 28-year old actor was asked to come into England's world famous Abbey Road Studios to sing some of John's biggest hits, which apparently blew the veteran musician away. With Bohemian Rhapsody on the way and Rocketman opening soon after, it's going to be a battle of the rock biopics at the box office. Rami Malek looks pretty impressive as the late great Freddie Mercury, but Taron Egerton looks equally as awesome playing Elton John. 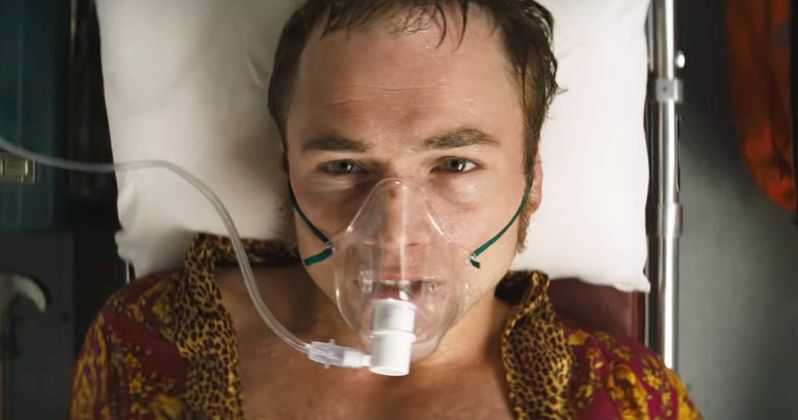 You can check out the first trailer for Dexter Fletcher's Rocketman below, thanks to Paramount.